Americans have made all the modern improvements in the dental art. Distressing operations are now painless, and the dental surgeon performs wonders in orthodontia. The cavemen doubtless extracted those fangs of their suffering brethren that began to decay when they ceased to crunch their prandial bones; lead fillings have been found in the teeth of Egyptian mummies, and prosthetic dentistry is two centuries old. 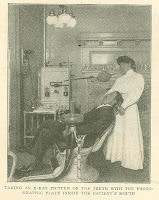 Nevertheless, it is within the last fifteen or twenty years that the art of dentistry has been brought nearer to perfection than in all its previous history, within two or three years that many of the most distressing dental operations have been rendered painless, and within a few months that the most highly improved method of filling the teeth has come into use. There are men and women still living who remember when the practice of dentistry, outside of the populous centers, was confined to the pulling of the teeth, the dentist being primarily the village blacksmith or tinker, whose fitness for the lesser function was measured by the strength of his wrist in operating the fearsome turnkey in the patient's mouth. 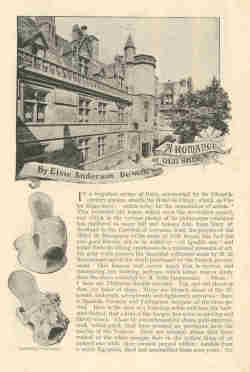 Few men whose talents would have qualified them for success in the learned professions were, at that time, attracted to dentistry, even in the larger cities; whereas the intellectual equipment of the up-to-date dentist to-day is not less than is required in any other branch of surgery. Many of our foremost dental practitioners have taken the degree of M.D. 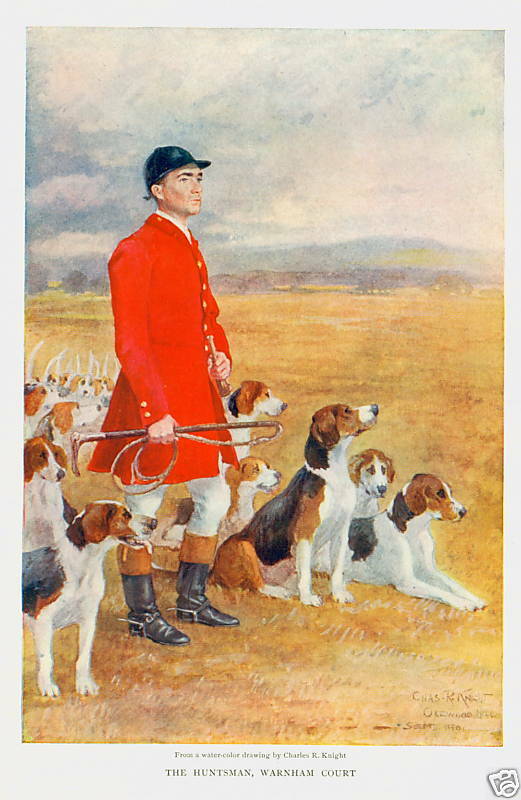 as well as that of D.D.S. Sarah Bernhardt, the world’s foremost actress of the day—Her personality, her art, and the secrets of her marvelous dramatic power. When Sarah Bernhardt dies, she dies. It is not a ridiculous mimicry; it is death, natural, pathetic, impressive. She knows what death is; she has studied it as no other artist has studied it—perhaps as no other artist is capable of studying it. The hospitals of Paris are her school. Here she is in touch with nature. She learns from nature, not from books. Imagination is not her guide. That is why in death scenes, Bernhardt rises to the sublime height of truth. It is this honest study—supplemented of course, by natural ability—that gives her marvelous mastery of her art. Diversity of language sets up no barrier for this woman, who moves men by what she is, rather than by what she says. Her magnetism is all conquering. 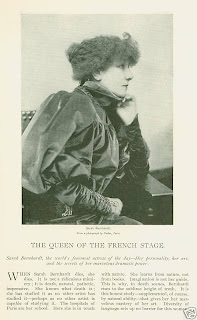 Other artists come to us and speak in foreign tongues to a select audience of critics, students, and dilettanti, but Bernhardt plays to a thronged house of the people, who drop their librettos to allow this wonderful woman to sway them by the mighty force of a genius whose field is as wide as the earth. Is it strange that Sardou, the master dramatist of our day, has made her the keystone on which all of his plays are built? The Daughter of Heaven, disguised in martial aspect and a heavy harness of armor, descended from the beleaguered ramparts of Nanking at the Century Theater, and stepped out of the gorgeous poetic atmosphere of Pierre Loti and Mme. Judith Gautier's Chinese love-tragedy into a severely modern and unimaginative stage reception-room for a few minutes' human chat. Only her eyes and voice were natural; but these would suffice for instant identification by anyone who had ever seen and heard Viola Allen. 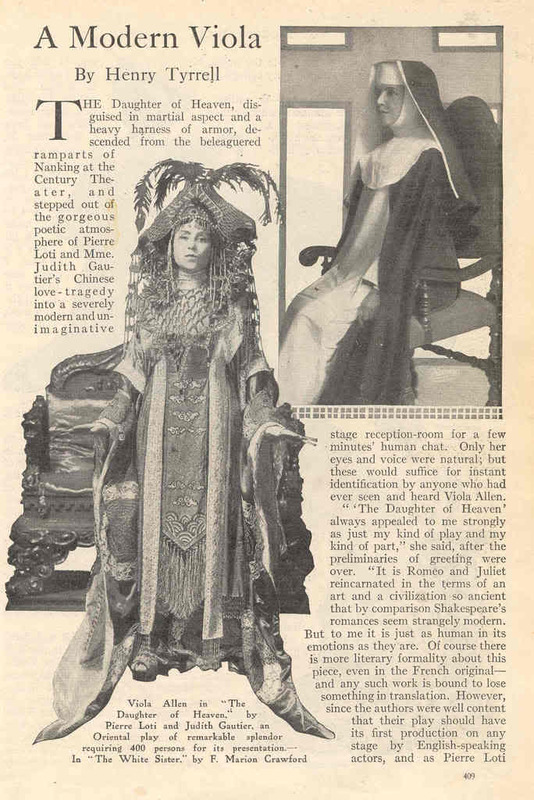 "'The Daughter of Heaven' always appealed to me strongly as just my kind of play and my kind of part," she said after the preliminaries of greeting were over. "It is Romeo and Juliet reincarnated in the terms of an art and a civilization so ancient that by comparison Shakespeare's romances seem strangely modern. But to me it is just as human in its emotions as they are. Of course there is more literary formality about this piece, even in the French original - and any such work is bound to lose something in translation. However, since the authors were well content that their play should have its first production on any stage by English-speaking actors, and Pierre Loti himself expressed unreservedly to us, to us and to the public his admiration of the result - why, there's glory enough for us all, don't you think?" "Don't you see anything worth notice in my acting?" she asks, with wonder and reproach in her rich voice and shining eyes. Of all the many important roles in Louis N. Parker's enormously popular Biblical pageant-play. "Joseph and His Brethren," now rounding out its initial season in New York City, the most trying undoubtedly is that of Joseph. 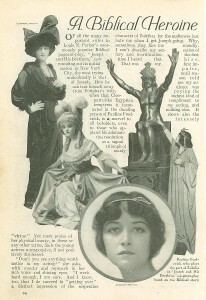 How he can tear himself away from Potiphar's wife, when that Cleopatra like Egyptian temptress is incarnated in the dazzling person of Pauline Frederick, is a marvel to all beholders, even to those who applaud his adamantine resolution as a signal triumph of manly "virtue." Yet mere praise of her physical beauty, in these or any other terms, finds the young actress unresponsive, if not positively displeased. Thirteen years ago, Alberto Santos-Dumont left his father's coffee plantation in the valley of the Rio Mogy Guassu, Brazil, an unknown lad. Last year on a visit to his native land he was met by war-ships, given railroad passes all over Brazil, and applauded wherever he went as the foremost inventor and practical air-ship builder in the world. He is thirty-one years old, five feet five inches in height, with dark hair and eyes, a slight well-knit figure, and is quick, but not nervous, in all his movements. When a student of the mining-school at Minas, he spent his vacations taking care of the engines on sixty miles of his father's private railroad, riding over every foot of the line in their cabs, and attending to repairs when necessary. Thus he learned practical mechanics. 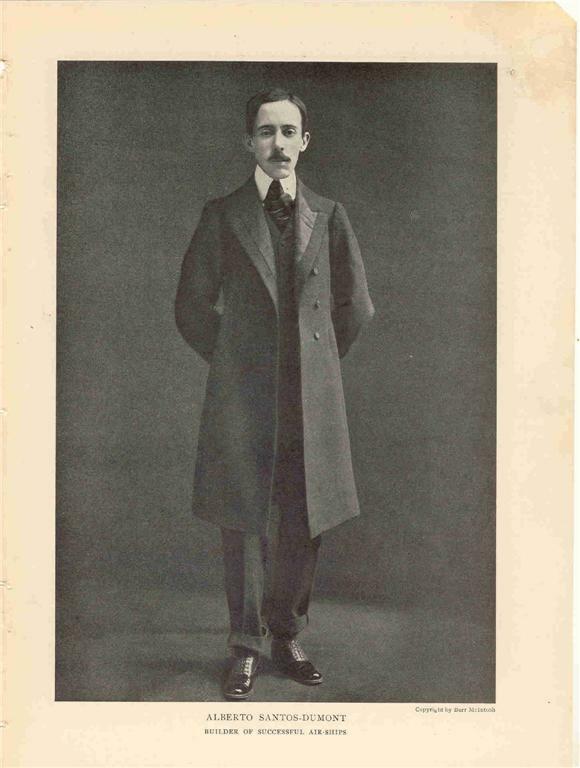 He then went abroad, climbed mountains in Switzerland, and was one of the first to take seriously to automobiling, experimented with kites and hot-air balloons, and studied aeronautics in France, the school of that subject. Forty youngsters dare-deviled around a ten-mile course at Venice, California, some little time ago in the Junior Vanderbilt Cup Race. They all had homemade one or two cylinder cars and they were all after one of the six silver cups and a share in two hundred and fifty dollars of prize money. Albert Van Vrankin, Jr., sailed home with the first prize in a little over thirty-seven minutes, although in the middle of the race he ran into a ditch, turned turtle, and had to extricate himself and his car. Most of the machines were ingenious adaptations of motorcycle engines to four-wheel crafts. Many of these cars, some of which are easily controlled, are capable of amazing speeds. At the race, the ten thousand spectators, including Barney Oldfield, Earl Cooper, and Teddy Tetzlaff, who judged the finish, cheered wildly as the contestants whirled around the track. Warnham court is the residence of Mr. Charles James Lucas. It lies between the town of Horsham and the picturesque village of Warnham, in the County of Sussex. About five hundred acres of the estate have been converted into a park, which is highly artistic in its arrangement. On every side the observer is pleasantly greeted with vistas of hills and green fields interspersed with woods and shiny lakes. Between the trees one catches glimpses of red and fallow deer quietly grazing, and over the whole there exists a pervading serenity which it is hard to realize can exist within thirty-five miles of the greatest of cities. But all is quiet, save for the chimes from the clock-tower. The house is a large and beautiful dwelling of gray stone in the Elizabethan style, built upon the highest of several terraces, almost surrounded by mounds of flowers, and commanding an extensive view of the park and country beyond, with the far off South Down hills fading away in the distance. To the south are the pleasure-gardens, in which are statuary, rustic seats, tennis-courts, cricket and croquet-grounds; and a little farther on are the flower gardens, with their glowing masses of color. A stone balustrade, twined with purple and white clematis and ornamented with urns of flowering plants, separates these grounds from the park proper. A short walk leads to the Rock Garden, where many varieties of rock-growing plants are cultivated. Nearby are numerous hothouses of fruit, orchids, and palms, and row upon row of trellised goose-berry vines, supporting luscious berries far exceeding in size and flavor any that can be grown in America. Eating is a dying art in America. In isolated districts, connected with the world that dines by R.F.D., it still survives. Everywhere else eating is giving way to dining. The sheer joy of lying in a cave and gnawing a bone has departed forever. "Mother" no longer can tip back her chair from the breakfast table, reach into the oven, draw out a smoking corn pone, and pour tree molasses over it, without causing shame to the girls. "Father" is no longer permitted to grab a roasting ear with both hands and pull it into his face until it touches his ears. Salt rising and dumplings have given way to tessellated floors and Chopin nocturnes. Within another generation all traces of the appetites that conquered the wilderness will have disappeared. No one will eat; all will dine. For that reason I wish to place on record this study of contemporaneous eating and cooking that the mouth of future America may water in recalling lost joys. 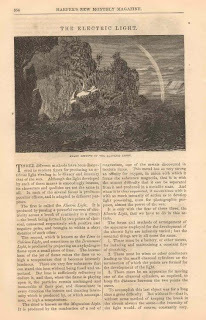 Three different methods have been discovered in modern times for producing an artificial light rivaling in intensity and brilliancy that of the sun. Although the light developed by each of these means is exceedingly intense, its characters and qualities are not the same in all. In each of the several forms it produces peculiar effects, and is adapted to different purposes. The first is called the Electric Light. It is produced by passing a powerful current of electricity across a break of continuity in a circuit - the break being formed by two pieces of charcoal, connected respectively with positive and negative poles, and brought to within a short distance of each other. The second, which is known as the Lime or Calcium Light, and sometimes as the Drummond Light, is produced by projecting an oxyhydrogen flame upon a small piece of lime. The intense heat of the jet flame raises the lime to so high a temperature that it becomes intensely luminous. There are very few substances that can stand this heat without being fused and vaporized. 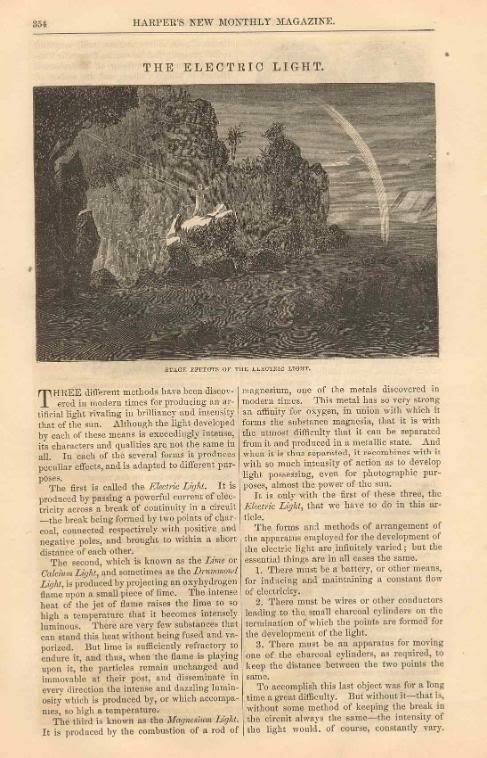 But lime is sufficiently refractory to endure it, and thus, when the flame is playing upon it, the particles remain unchanged and immovable at their post, and disseminate in every direction the intense and dazzling luminosity which is produced by, or which accompanies, so high a temperature. In a forgotten corner of Paris, surrounded by its fifteenth century garden, stand the Hotel de Cluny, which as Victor Hugo says: "exists today for the consolation of artists." This beautiful old house, which even the revolution spared. This famous roof covers much that is curious and interesting, but nothing, perhaps, which better repays study than the shoes collected by M. Jules Jacquemart. The unique and splendid collection was made my M. Jacqumart during thirty years of ceaseless searching. it has now attained a world-wide celebrity and nowhere else can the student of archaeology find more precious information. Here are the sixteenth-century pattens from Venice, of white leather so finely cut that it resembles guipure lace. Another Venetian shoe is white with tufts of rose still studding it. I think the principal significance it has for nineteenth-century eyes is its great utility to a gouty owner and its superiority in comfort over red flannel and a supporting chair.